Is there life beyond our solar system? 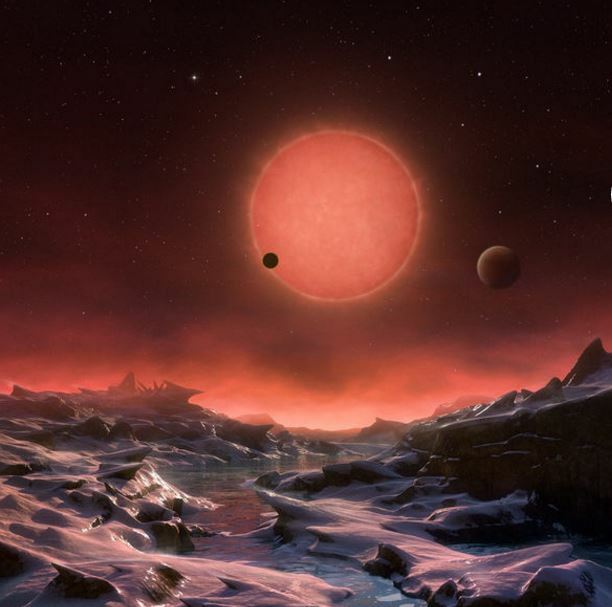 If there is, our best bet for finding it may lie in three nearby, Earth-like exoplanets. For the first time, an international team of astronomers from MIT, the University of Liège in Belgium, and elsewhere have detected three planets orbiting an ultracool dwarf star, just 40 light years from Earth. The sizes and temperatures of these worlds are comparable to those of Earth and Venus, and are the best targets found so far for the search for life outside the solar system. The results are published today in the journal Nature. The scientists discovered the planets using TRAPPIST (TRAnsiting Planets and PlanetesImals Small Telescope), a 60-centimeter telescope operated by the University of Liège, based in Chile. TRAPPIST is designed to focus on 60 nearby dwarf stars—very small, cool stars that are so faint they are invisible to optical telescopes. Belgian scientists designed TRAPPIST to monitor dwarf stars at infrared wavelengths and search for planets around them. The team focused the telescope on the ultracool dwarf star, 2MASS J23062928-0502285, now known as TRAPPIST-1, a Jupiter-sized star that is one-eighth the size of our sun and significantly cooler. Over several months starting in September 2015, the scientists observed the star’s infrared signal fade slightly at regular intervals, suggesting that several objects were passing in front of the star. With further observations, the team confirmed the objects were indeed planets, with similar sizes to Earth and Venus. The two innermost planets orbit the star in 1.5 and 2.4 days, though they receive only four and two times the amount of radiation, respectively, as the Earth receives from the sun. The third planet may orbit the star in anywhere from four to 73 days, and may receive even less radiation than Earth. Given their size and proximity to their ultracool star, all three planets may have regions with temperatures well below 400 kelvins, within a range that is suitable for sustaining liquid water and life. From their observations, the scientists determined that all three planets are likely tidally locked, with permanent day and night sides. The two planets closest to the star may have day sides that are too hot, and night sides too cold, to host any life forms. However, there may be a “sweet spot” on the western side of both planets—a region that still receives daylight, but with relatively cool temperatures—that may be temperate enough to sustain conditions suitable for life. The third planet, furthest from its star, may be entirely within the habitable zone. As for next steps, de Wit says the objective is clear. The 5:8 ratio of the orbital periods is interesting, as is the tidal locking. says it is 2550 K which means about the same luminosity as a standard 2700K light bulb…. Yes, far cooler than our 5000K+ sun, but I can still grow plants under lightbulbs, and see nicely. Yeah, tidal locking is presumably pretty common among planets that orbit that closely to their sun, as it’s caused by the gravitational gradient, which falls off with the third power of distance. The closer the two bodies, the more likely the tidal locking. Sparks, how do you know this for a fact? Has there been bananas found? Yes! Has there been life found? No! There has been no life found whether Bananas grow in you garden or not, it’s still a fact that there is no life out there. Nice comeback I nearly covered my screen. But it is logical a fact. Do aliens like bananas? We should be told. If we send the folks up there an email now, we could get a reply in a little over 80 years. The third planet MAY orbit the star in anywhere from four to 73 days, and MAY receive even less radiation than Earth. There MAY be $10,000 dollars in my sock drawer. I think I’m going to go right now to check. Ergo the outer hemisphere receives no input. How could the atmospheres of these bodies not have all frozen out on the perpetually-cold side?? Forget the “sweet spot” (slice? ); that heat sink has to be cycled through the warm side, else there is no habitability! The Cold side/Warm sliver/Hot side makes for a neat setting for a SF tale, but practicality over-rides the Suspension-of-Disbelief here…. Would life that evolved 100,000 years ago, but 120,000 light years away, not exist for 20,000 years, then suddenly have existed for 120,000 years once heard from? Your belief leads to such logical contradiction, therefor is untenable. Venus is 67.25 million miles from the Sun, the Earth, 93 million. The radiating temperature of Venus should be 1.176 times that of the Earth. Without ANY greenhouse effect as promulgated by the IPCC, at any given pressure within the range of the Earth atmosphere, the temperature of the Venus atmosphere should be 1.176 times that of the corresponding Earth atmosphere. The actual ratio overall is 1.165 +/- 0.015 = 0.991 x 1.176. It does not vary from the no-greenhouse theoretical value at any point by more than about 2%. There is no sign whatever of a greenhouse effect on either planet. The fact that the temperature ratios are so close to that predicted solely by their relative distances from the Sun tells us that both atmospheres must be warmed, overall, essentially in the same way, by direct IR solar irradiation from above, not by surface emissions from below. Keeping it simple, the atmospheres must be like sponges, or empty bowls, with the same structure (hydrostatic lapse rate), filled with energy by the incident solar radiation to their capacity to hold that energy. There is no greenhouse effect on Venus with 96.5% carbon dioxide, and none on the Earth with just a trace of carbon dioxide. @ Sparks, after a lot of careful analysis of both chemistry and life, it would seem that given the right conditions on any planet, the spontaneous creation of the building blocks of life are a surety. If the conditions last long enough life, in all its glory is a sure thing. I still love all the comparisons, of listing estimated output per sun averaged/ whatever. I think, you are all wrong. It’s like averaging a campfire. At a distance it averages so much heat. But? It varies in temperature. Because of other variables. A breeze comes from another direction, or that side of the fire cools. Why? As our star, it is called a variable, why? It’s output varies. Why? It’s a fire. Every place, is different, different chemical compositions of the gasses that are embedded in the structure. As such, it outgasses those ions depending on other processes. Sometimes they are strong. And we warm. But, there are other influences, such, as a gas ball, it’s not on center, therefore we are not equidistant from the center, our orbit is variable, and our orientation isn’t stable to the star. But we average input from old textbooks, because that’s how it’s done. Amazing.